One Offs Limited are proud to have been approached by the Artist Julian Taylor to help with the creation of this project. Artist Julian Taylor did a fine job of reflecting the mood at this week’s Hillsborough memorial service. 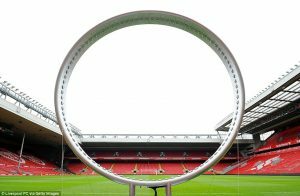 The sculptor’s Band of Life artwork stood proudly in front of the Kop with the large metal circle’s 96 lights each representing one of the victims of the 1989 disaster. The Hillsborough Band of Life that featured at the 25th anniversary memorial at Anfield stadium has gone on show at Liverpool cathedral. The special sculpture – which was commissioned by the Mayor of Liverpool Joe Anderson – remembered the 96 victims of the Hillsborough disaster took up residence at the venue today. It will remain there until the end of September. The art–sculpture is a simple band representing the bond between the families, friends and fans who were brought together in a time for the love of the lost ones. It is also seen as a continuous circle of love bringing the city of Liverpool together to remember. The Band of Life will reside in the Chapter House which was set aside for personal prayer on the day the Hillsborough Independent Panel published their report in September 2012. 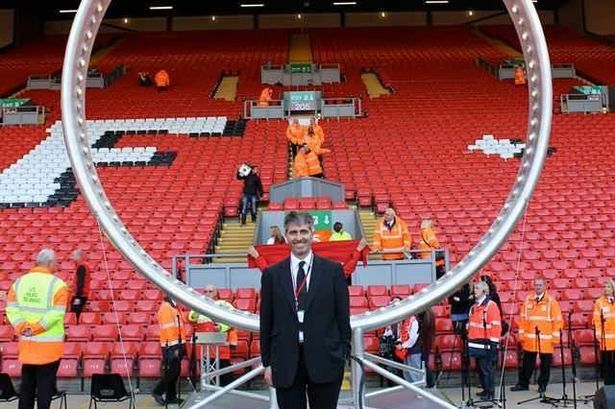 Its arrival coincided with the special premiere of Michael Nyman’s Hillsborough Memorial which takes place on Saturday. “The sculpture is a perfect way for us to remember the 96 lives lost, seeing each light lit is as poignant today as when we first saw it.